Kyle Konetchy belongs to Troop 170 from Pollock Pines and became an Eagle Scout at his Court of Honor on Saturday, October 29. The First Church of Christ, Scientist in Placerville was filled with supportive loved ones, community members, and Scouts from every generation. The ceremony lasted for one hour and was directed by the troop’s Scoutmaster, Matt Werts, and Master of Ceremonies, Eagle Scout, William Kinser. Many people spoke of Kyle’s dedication to the organization and passion for serving others. Kyle awarded mentor pins to those who helped him along the way and endearingly broke down in tears when addressing those who helped guide his journey, but are no longer with us. His sweet grandmother assured him that those individuals were with him in spirit. “I’m so appreciative of my parents, mentors, and fellow scouts. I think today stands for not just a single event, but everything that happened over the years and everyone who was a part of it” Kyle said. 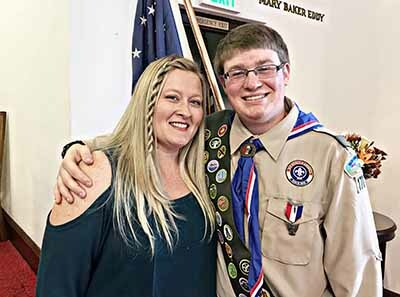 Kyle’s mother, Pamela Matthews, is an Account Technician at the El Dorado County Office of Education (EDCOE) and beamed with pride when Kyle officially became an Eagle Scout at the end of the ceremony. “I’m very proud of his accomplishment. He has worked so hard and met challenges with honor and dignity. He has grown into a leader who gives back to those who need it,” she expressed. This young gentleman started his career in the third grade with The Boy Scouts of America which is one of the nation’s largest and most prominent values-based youth development organizations. It provides a program for young people that builds character, trains them in the responsibilities of participating citizenship, and develops personal fitness. Over many years, Kyle has dedicated much of his personal time through projects such as helping to build an outdoor seating area called Scout Hill in Sly Park, serving Thanksgiving and Christmas dinners at the Community Center in Pollock Pines, providing Fourth of July breakfasts at the Fire Station, helping other Scouts with their projects, and many more. Every Eagle Scout must complete a project before promoting, so Kyle constructed large wooden cabinets for the El Dorado High School Drama Department. As a student, Kyle cultivated his skills in the kitchen through the high school’s Culinary Arts Program and Foothill Grill. He graduated in May of this year and enlisted in the United States Navy. In July 2017, he will report to Great Lakes, Illinois for boot camp and training to become a Culinary Specialist.